The wakizashi and the two katana are all listed as being from the Edo period. Top to bottom, the smiths are Fujiwara Daido (c. 1650), Kunimasu (c. 1670) and Fujiwara Tadakuni (c. 1650). The finely formed bo-hi, particularly on the wakizashi, were indeed what caught my attention as well. Thank you for the really wonderful pictures. Considering the conditions you had to cope with you did a stupendous job. I have to ask this, in the first batch of photos you sent there is a picture of a pretty sturdy Viking sword with the lobed pommel. Do you know what the actual handle is made from? I ask for two reasons; first because it's my understanding that there are almost no Viking age swords that have the existing handle material present and second because I once had an original Marbles hunting knife with the leather ring handle that some fool put in our dishwasher and the handle came out looking like that. I was not amused! too great. I keep a scrapbook of such items that interest me and aren't elsewhere published and I would like to add these to the collection. Many thanks in advance for your consideration. Thanks, C.L.! Your photos are great, espeically having been shot through optically-impaired glass. I'm amazed at the level of preservation for a few of those Viking and knightly swords. Did the display indicate where the better-preserved specimens were found? WOW! Great photos! Thanks for sharing these. I love the Viking swords. I also really like the one with the type N (?) pommel. It's very unusual! Do you know what the actual handle is made from? There was no information given concerning the material covering the grip, although I'd say it is almost certainly leather. My guess is that the grip is not the original, but rather a later addition. TAs far as additional information goes, he museum does suggest that the barely discernible inlay may read "NILERK," and lists the sword as having been discovered in London. I hope that helps, and if you need more information, I'd definitely suggest e-mailing the museum. Not all of the swords had locations listed, although some did. In the Viking case, the first hanging sword on the left, which looked to me like a Petersen Distinctive Type 2, was reportedly discovered in the river Seine. The Type S hanging to its right is listed as having been found in London. No find-sites are listed for either the type M at the bottom of the case, nor the exquisite Wheeler Type VII (Type U variant?) hanging at the far right. 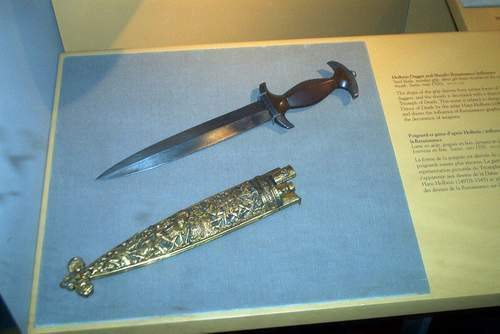 The designated typology for all swords is, of course, my own best guess and not the museum's own categorization. 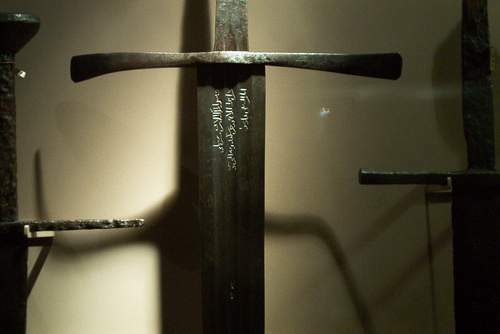 In "The Knight at War" case, the first sword from the left has no location listed, the second was found in Lancashire (though still thought to be of German origin), the three-fullered third sword was deposited in the arsenal of Alexandria (although believed to have originated in Italy), while the fourth sword is German. The Great Sword which appears in photos 34-37 is only labeled as being "probably French or German." The first three swords in the next case (images 38, 40-45) are all from the Alexandrian Arsenal. Great photos! I went to ROM during the summer but silly me didn't bring a camera along, didn't know how they would take to that. The selection of photos provided were more than generous, however, did you happen to by chance get a look at the pole arms and the two-handed sword in the lobby? when I was there I became quite fond of that sword . Again thanks for the great photos! Steel or iron blade; iron pommel; copper and silver inlay on hilt; hand-forged, chiselled and/or filed and inlaid. Area of Use: Dredged from the Thames at Vauxhall (London, England); Fairly wide distribution; possibly carried by ship by Viking raiders. A type widely used in Europe and found in Scandinavia, Britain, in rivers along the western coasts of France. Examples have been found in the Scheldt, the Thames, the River Lea, and at York, as well as from the Seine at Paris. Now, don't quote me on this, but I heard that if you email the muesum, they will actually send you a photograph of any item that you wish. Also, I'd like to let people know that I am heading to the ROM this weekend, so if anyone wishes for photographs of particular pieces, I'd be more then happy to try to help. Wow C.L. Those are great! I love the early Type X with the copper inlay. Many of those Viking blades are in fantastic condition. Sorry if I missed it, but were any of those viking pieces found in the North America, or are they all European or Greenland and Iceland finds? Thanks again for the great pics, now I have another reason to move to Canada! That last viking sword is a real beauty. Wouldn't mind seeing it reproduced. Some were, however some of the ones with the arabic script on them were kept in the arsenal of Alexandria. You can read details on at least two of those swords in Oakeshott's books. The ROM is the only major museum I've ever had the opportunity to visit and it's really quite an impressive place, there are a lot of good exhibits and even though of course the Arms and Armor were also my primary focus I did take the time to cover the rest. J.D. Crawford, the Viking sword that you are referring to was presented to the museum by the late Dr. Sigmund Samuel in the '20s and here's the photo. I have to say that my heart belongs to that seax in the first picture here. I think the proportions are beautiful and I can't help but wonder what it looked like a thousand years ago. It is amazing to me that so many seaxes look so much like Bowie knives I guess it is a tribute to the timelessness of a good design. Do you happen to remember its approximate length or should I e-mail the ROM?